PRICE REDUCED. Located on a large corner lot with a spacious front porch and cool ocean breezes. You are welcomed into a large living room with a cathedral ceiling. Kitchen has lots of room for preparation, storage and helping hands, and a breakfast bar. The bright family room is off the kitchen with a sliding door entrance to the porch. Large master bedroom and bath with an extra-large walk in closet. Laundry room has a utility sink right near the back door. Home has lots of storage inside as well as an attached room off the back door. Driveway has pavers that are part of the garden area. Concrete walkway around back of home. One of the larger original homes in the park on a large corner lot. Shorecliffs Terrace is an active senior community with lots of amenities and activities. 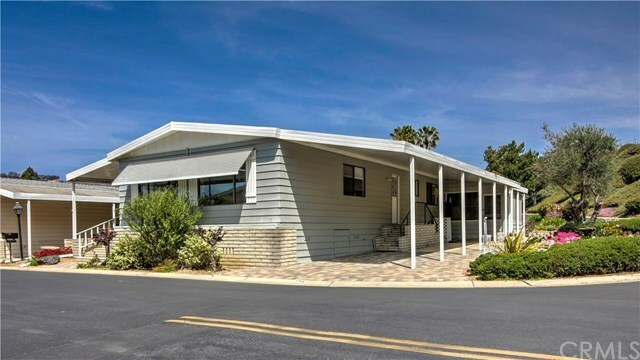 Come enjoy retirement in life in beautiful San Clemente with land ownership at an AFFORDABLE price. Owner is motivated. Home back on market at a reduced price.